Create a beautiful, filterable, and searchable directory that allows users to manage and even pay for their WordPress classified ads. Sell anything from cars to real estate. Your project may not be the next Craigslist. But even smaller, more specialized WordPress classified ads sites require some extra features that you don't often see. So how do you make it work? Do you go with an expensive specialized theme or plugin made just for classified ads? Or is there a more flexible option? If you're already familiar with Formidable Forms, you know just how powerful it can be as a web application building tool. Leverage this power to create a classified ads site that integrates seamlessly with WordPress. Display a beautiful, filterable and searchable directory that allows users to manage their listings and even take payments. What does it take to put together a custom WordPress classified ads site? This is too big a subject to offer an in-depth tutorial in a single blog post. So I'll cover the process overview, and provide links to more detailed documentation on the individual steps. To follow this tutorial, you'll need a license for Formidable Pro for data management (some features aren't available in the free version), the User registration add-on, the MailChimp forms add-on, and the Paypal standard add-on to process payments. The Stripe payments add-on is also worth installing. That way you can give your customers a choice of payment methods, although you do need an SSL cert to use Stripe on your website. If you're building a classified ads website, chances are that you'll have a good number of categories and sub-categories. This structure helps a user navigate easily and filter results quickly to find what they need. You'll probably need to add extra categories in the future too, as your community gets busier and you see the need to expand in some areas. Build a form to add your categories to make this process simple. Use lookup fields on the "New Listing" form so it will always stay in sync. 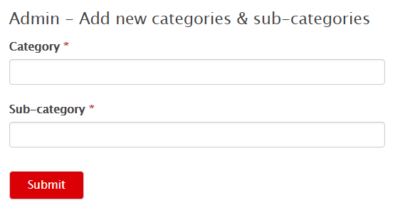 Then when you add a new category, it will be immediately available for users to choose from. This category form will include two simple single line text boxes. It will be published on a page that is only visible to Admin. Initially, for the sake of speed, I will bulk import a CSV file containing my main category and sub-category definitions. But having the form on a page will make it easy to add new categories if required. Alternatively, if you're using a WordPress custom post type for your classified ads, you can create your categories in a custom taxonomy. Then dynamic fields will use your custom hierarchal categories to fill the dropdowns. If you go this route, you can skip this category form and manage the categories in WordPress. To allow users to edit their own listings, we need them to be logged in. So I'll add a page with a login form and a registration form. This is simple using the User registration add-on. Just add the shortcodes to the page and the job is done. 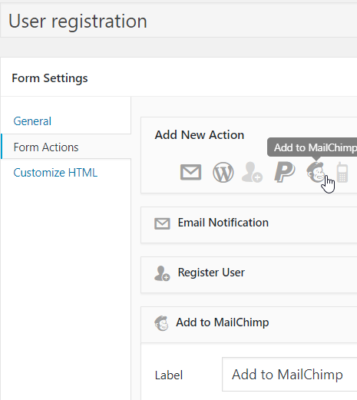 ** Bonus ** Include a MailChimp action in your new user registration form. This adds all new users to your MailChimp mailing list to help drive your email marketing success! Your new listing form is perhaps the most important part of the process. But this is also the part that will need to be customized the most to fit your exact needs. Take some time to think about what your users really need to see on each listing and tailor your form to meet your unique requirements. Most classified forms will contain fields for the advertiser's postal address, contact number and email address. Plus a field for the price, an item description field, and a photo upload field that can take up to 10 images. It would usually have lookup fields that pull data from your categories form or dynamic fields to get your WordPress categories, and a hidden date field to control the listing expiration date. Your New Listing form will probably need some conditional field logic too. For example, if your classified ads website has a section for used cars, listings in this section will need additional information such as Mileage, Fuel Type, Transmission, etc. Use conditional logic to show these additional fields only when the used cars category is selected. Your New Listing form is also the place to take payments. Read more about using the PayPal add-on and the Stripe add-on . A classified ads website without a search form is about as useful as a chocolate toothbrush. So this is something you need to get right. Your listings will be displayed in a View. A custom search form is needed to search those listings. Exactly how you setup your form depends a lot on the type of classified ads site you are running. Read more detailed instructions for building your search form. ** Pro Tip ** I personally found my classified ads search form gave the most relevant results if only one text/keyword field was used. Dropdown fields can be used to filter by category, sub-category, and even town and state. Then a single (optional) keyword field finishes the search form. It's essential to let users edit their classified listings. A user may want to reduce the price for a quicker sale, upload better photos, add more details about the item, or mark it as sold. To enable ad editing, use front-end editing via a View. The View should be filtered by "User ID is equal to current_user" so each user can only see and edit their own ads. Your WordPress classified ads system works great. But can you make it even better? We don't have space to cover it in this tutorial, but adding a user profile form, a star rating or trust-scoring system for each user, or even making user feedback visible on each profile page could give first-time visitors the confidence they need to contact an advertiser or make a purchase. You can also use 3rd-party plugins to take the Address Fields and display pinpoints on a map so users can see at a glance which listings are closest to them. We love to see examples of the classified ads site you create with Formidable Forms. Take a look at It's my Town, a great WordPress classified ads site built by a Formidable community member. If you're particularly proud of your website, submit it to the showcase gallery on our Community Website.